The original homemade taste. Just add water. Suitable for vegetarians. 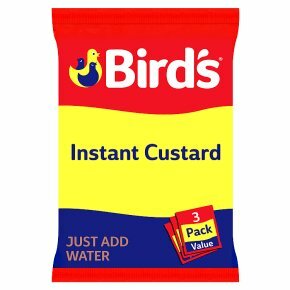 Quick and easy custard in a few steps A Sachet makes 3 servings All You Need Measuring Jug Whisk/Fork 360ml Boiling Water Directions 1 Empty the sachet into a large measuring jug and pour on Boiling Hot water up to 3/4 pint (425ml) level. 2 Whisk (or stir with a fork) vigorously until smooth and creamy ensuring all the powder at the bottom is mixed in. 3 Stand for 1 minute before serving. You Make it Special For slightly thinner custard add more boiling water. For sweeter custard stir in a little sugar.